Midtown Manhattan is the central portion of the borough of Manhattan in New York City. Midtown is home to some of the city's most iconic buildings, including the Empire State Building, the Chrysler Building, the Hudson Yards Redevelopment Project, the headquarters of the United Nations, Grand Central Terminal, and Rockefeller Center, as well as Broadway and Times Square. Midtown Manhattan is the largest central business district in the world and ranks among the most expensive pieces of real estate; Fifth Avenue in Midtown Manhattan commands the world's highest retail rents, with average annual rents at US$3,000 per square foot ($32,000/m2) in 2017. However, due to the high price of retail spaces in Midtown, there are also many vacant storefronts in the neighborhood. Midtown is the country's largest commercial, entertainment, and media center, and also a growing financial center. The majority of New York City's skyscrapers, including its tallest hotels and apartment towers, are in Midtown. The area hosts commuters and residents working in its offices, hotels, and retail establishments, tourists and students. Times Square, the brightly illuminated hub of the Broadway Theater District, is a major center of the world's entertainment industry. Sixth Avenue also has the headquarters of three of the four major U.S. television networks. Midtown is part of Manhattan Community District 5. It is patrolled by the 14th and 18th Precincts of the New York City Police Department. In addition to its central business district, Midtown Manhattan encompasses many neighborhoods, including Hell's Kitchen and Chelsea on the West Side, and Murray Hill, Kips Bay, Turtle Bay, and Gramercy Park on the East Side. It is sometimes broken into "Midtown East" and "Midtown West", or north and south as in the New York City Police Department's Midtown North and Midtown South precincts. Madison Square and the Flatiron District, the area surround the intersection of Broadway, Fifth Avenue and 23rd Street. Midtown is the original district in the United States to bear the name and included historical but now defunct neighborhoods such as the Ladies' Mile, along Fifth Avenue from 14th to 23rd Street; and the Tenderloin, from 23rd to 42nd Street and from Fifth Avenue to Seventh Avenue. The area between 14th and 86th Streets includes roughly the center of Manhattan; however, the term Midtown Manhattan can also apply to the area between 31st Street and 59th Streets, although there are still office buildings south of 31st Street. Manhattan Community District 5 is located from 14th to 59th Streets, generally between Lexington Avenue and Eighth Avenue. Community District 5 is largely coterminous with Midtown but also includes the Flatiron District, NoMad, Union Square, and parts of Gramercy Park and Rose Hill. Midtown proper (within the boundaries of Manhattan Community District 5, and excluding overlapping neighborhoods) is located from 34th to 59th Streets between Third Avenue and Eighth Avenue. The "Plaza District", a term used by Manhattan real estate professionals to denote the most expensive area of midtown from a commercial real estate perspective, lies between 42nd Street and 59th Street, from Third Avenue to Seventh Avenue, about a square kilometer or half a square mile. "Midtown South" can refer to the part of Midtown between 23rd Street and around 42nd Street (although its northern boundary is defined differently depending on the source). "Midtown West" can refer to the area between 34th and 59th Streets, and between 5th and 12th Avenues. "Midtown East" can refer to the area between 42nd and 59th Streets, and between 5th Avenue and the East River. In 1982, the City of New York identified the "Manhattan Core" as the area that includes some of the City’s most populous neighborhoods, major institutions, parks and transit hubs, and the City’s primary Central Business District (CBD), defined as Manhattan below 60th Street. The "Manhattan Core" includes some areas slightly further north of 86th Street in Manhattan, as well as the area below 14th Street; however, this definition is problematic because it ignores the fact that Manhattan has not one but two zones in which people do business within this area separated by a wide swath of low-rise (by New York City standards) residential development — there is Midtown (which is in Midtown Manhattan), and the Financial District, (also known simply as "Downtown" because of its location in Downtown Manhattan). In other sources these districts are referred to as separate central business districts. 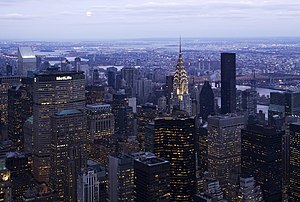 Midtown Manhattan, along with Lower Manhattan, is one of the world's leading financial centers. Midtown Manhattan is the world's largest central business district, with 400 million square feet (37.2 million m2) of office space in 2018. Midtown contains the headquarters of major companies, including 4Kids Entertainment, Barnes & Noble, Bloomberg L.P., Ernst & Young, Calvin Klein, Cantor Fitzgerald, CBS Corporation, Citigroup, Colgate-Palmolive, Cushman & Wakefield, DC Comics, Deloitte, Duane Reade, Estée Lauder Companies, Foot Locker, Frederator Studios, JPMorgan Chase, Hess Corporation, Kroll Inc., L-3 Communications, Marsh & McLennan Companies, Marvel Entertainment, MetLife, MidOcean Partners, Morgan Stanley, NBC Universal, The New York Times Company, NexCen Brands, Pfizer, Polo Ralph Lauren, Saks Incorporated (Saks Fifth Avenue), The Sharper Image, Simon & Schuster, Six Flags, TBWA Worldwide, Thomson Reuters, Time Warner, Time Warner Cable, The Travelers Companies, Univision Communications, and Viacom. The New York Institute of Finance is located in Midtown Manhattan. Haier operates its United States offices in the Haier Building at 1356 Broadway; the building used to be a building of the Greenwich Savings Bank. Haier held the opening ceremony on March 4, 2002. Sumitomo Corporation operates its New York Office, the headquarters of the corporation's United States operations, at 600 Third Avenue, 10016 in the Murray Hill neighborhood. El Al's North American headquarters are in Midtown. The Air France USA regional headquarters are in 125 West 55th Street in Midtown Manhattan. Hachette Book Group USA has its headquarters in 237 Park Avenue. In 1994 Alitalia considered moving its USA headquarters from Midtown to Lower Manhattan, but decided to keep the offices where they were at the last minute. Global Infrastructure Partners has an office in Midtown Manhattan. Silicon Alley, the common metonym for New York City's high tech sector, is based in Midtown South, specifically the Flatiron District. Prominent Silicon Alley companies in Midtown include AppNexus, Blue Apron, Gilt, Betterment, Oscar, SoFi, Rent the Runway, Warby Parker, and WeWork. The technology sector has been expanding across Midtown Manhattan since 2010. The biotechnology sector is also growing in Midtown Manhattan based upon the city's strength in academic scientific research and public and commercial financial support. By mid-2014, Accelerator, a biotech investment firm, had raised more than US$30 million from investors, including Eli Lilly and Company, Pfizer, and Johnson & Johnson, for initial funding to create biotechnology startups at the Alexandria Center for Life Science, which encompasses more than 700,000 square feet (65,000 m2) on East 29th Street and promotes collaboration among scientists and entrepreneurs at the center and with nearby academic, medical, and research institutions. 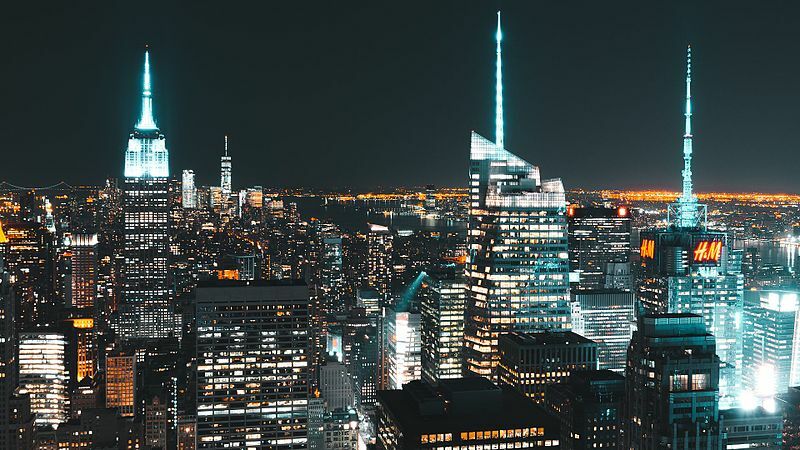 Biotechnology is emerging in Midtown Manhattan, bolstered by the city's strength in academic scientific research and public and commercial financial support. By mid-2014, Accelerator, a biotech investment firm, had raised more than US$30 million from investors, including Eli Lilly and Company, Pfizer, and Johnson & Johnson, for initial funding to create biotechnology startups at the Alexandria Center for Life Science, which encompasses more than 700,000 square feet (65,000 m2) on East 29th Street and promotes collaboration among scientists and entrepreneurs at the center and with nearby academic, medical, and research institutions. The New York City Economic Development Corporation's Early Stage Life Sciences Funding Initiative and venture capital partners, including Celgene, General Electric Ventures, and Eli Lilly, committed a minimum of US$100 million to help launch 15 to 20 ventures in life sciences and biotechnology. Real estate is a major force in Midtown Manhattan's economy, and indeed the city's, as the total value of all New York City property was assessed at US$914.8 billion for the 2015 fiscal year. Manhattan has perennially been home to some of the nation's, as well as the world's, most valuable real estate, including the Time Warner Center, which had the highest-listed market value in the city in 2006 at US$1.1 billion, to be subsequently surpassed in October 2014 by the Waldorf Astoria New York, which became the most expensive hotel ever sold after being purchased by the Anbang Insurance Group, based in China, for US$1.95 billion. 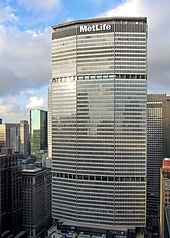 When 450 Park Avenue was sold on July 2, 2007, for US$510 million, about US$1,589 per square foot (US$17,104/m²), it broke the barely month-old record for an American office building of US$1,476 per square foot (US$15,887/m²) based on the sale of 660 Madison Avenue. In 2014, Manhattan was home to six of the top ten zip codes in the United States by median housing price. In 2019, the most expensive home sale ever in the United States achieved completion in Midtown Manhattan, at a selling price of US$238 million, for a 24,000 square feet (2,200 m2) penthouse apartment overlooking Central Park. 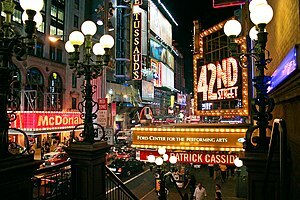 According to The Broadway League, shows on Broadway sold approximately US$1.27 billion worth of tickets in the 2013-2014 season, an increase of 11.4% from US$1.139 billion in the 2012-2013 season; attendance in 2013-2014 stood at 12.21 million, a 5.5% increase from the 2012-2013 season's 11.57 million. Companies that used to have their headquarters in Midtown Manhattan include American Airlines, American Comics Group, American Overseas Airlines, Central Park Media, Eastern Air Lines, GoodTimes Entertainment, LJN, NewKidCo, Pan American World Airways, Philip Morris Companies (now Altria Group), Trans Caribbean Airways, and Trans World Airlines. In 1997, Aer Lingus announced that it was moving its North American headquarters from Midtown to Melville, New York, in Suffolk County on Long Island. Based on data from the 2010 United States Census, the population of Midtown Manhattan was 28,630, a change of 2,823 (9.9%) from the 25,807 counted in 2000. Covering an area of 692.81 acres (280.37 ha), the neighborhood had a population density of 41.3 inhabitants per acre (26,400/sq mi; 10,200/km2). The racial makeup of the neighborhood was 64.1% (18,351) White, 4.6% (1,310) African American, 0.1% (34) Native American, 20.8% (5,942) Asian, 0% (8) Pacific Islander, 0.3% (92) from other races, and 2% (569) from two or more races. Hispanic or Latino of any race were 8.1% (2,324) of the population. The 18th Precinct has a lower crime rate than in the 1990s, with crimes across all categories having decreased by 84.2% between 1990 and 2018. The precinct saw 3 murders, 21 rapes, 130 robberies, 190 felony assaults, 175 burglaries, 1,875 grand larcenies, and 31 grand larcenies auto in 2018. The 14th Precinct also has a lower crime rate than in the 1990s, with crimes across all categories having decreased by 88.6% between 1990 and 2018. The precinct saw 0 murders, 19 rapes, 150 robberies, 199 felony assaults, 210 burglaries, 2,005 grand larcenies, and 23 grand larcenies auto in 2018. 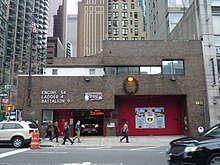 The greater Midtown area between 14th Street and 59th Street contains seven additional fire stations. The nearest major hospitals are Beth Israel Medical Center in Stuyvesant Town, as well as the Bellevue Hospital Center and NYU Langone Medical Center in Kips Bay, and NewYork–Presbyterian Hospital in Upper East Side.. Midtown Manhattan is located within six primary ZIP Codes. West of Fifth Avenue, Midtown is located in 10018 between 34th and 41st Streets, 10036 between 41st and 48th Streets, and 10019 between 48th and 59th Streets. East of Fifth Avenue, Midtown is located in 10016 between 34th and 40th Streets, 10017 between 40th and 49th Streets, and 10022 between 49th and 59th Streets. The area southwest of Fifth Avenue and 34th Street, sometimes considered to be in Midtown, is part of 10001. Other areas between 14th and 34th Streets are covered by ZIP Codes 10003, 10009, 10010, and 10011, though these are generally not considered to be part of Midtown proper. There are also thirty-three ZIP Codes assigned to individual buildings or building complexes. In addition, the James A. Farley Station, the city's main post office, is located at 421 8th Avenue. The post office stopped 24-hour service in 2009 due to decreasing mail traffic. Midtown Manhattan generally has a higher rate of college-educated residents than the rest of the city. A majority of residents age 25 and older (78%) have a college education or higher, while 6% have less than a high school education and 17% are high school graduates or have some college education. By contrast, 64% of Manhattan residents and 43% of city residents have a college education or higher. :6 The percentage of Midtown Manhattan students excelling in math rose from 61% in 2000 to 80% in 2011, and reading achievement increased from 66% to 68% during the same time period. There are no public elementary or middle schools in Midtown. Private schools include The Beekman School, Rebecca School, and a number of private language and music centers (e.g. Berlitz, American Language Communication Center, New York Language Center, Swan Music School, and the New York Youth Symphony). The La Scuola d'Italia Guglielmo Marconi Italian international school moved to West Midtown in 2016. The New York Public Library (NYPL) operates two reference branches in Midtown. The Stephen A. Schwarzman Building (also the Main Branch) is a reference branch at 476 Fifth Avenue. The four-story building, constructed in 1911, is known worldwide for its architecture and has several million items in its collections. The Science, Industry and Business Library (SIBL) is located at 188 Madison Avenue. SIBL, created in 1996, contains a large collection of business-related materials. 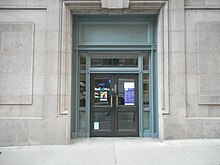 The 53rd Street branch is located at 18 West 53rd Street. The three-level branch opened in 2016, replacing the former Donnell Library Center that had been open from 1955 to 2008. The 58th Street branch is located at 127 East 58th Street. The branch opened in a Carnegie library building in 1907 and moved to its current two-story space in 1969. The Grand Central branch is located at 135 East 46th Street. The two-story library opened in 2008. The Mid-Manhattan branch is located on the ground level of the Schwarzman Building. It was founded in 1970 and moved to a five-story space in 8 East 40th Street in 1981. That location was closed for renovations from 2017 to 2020. The Terence Cardinal Cooke-Cathedral branch is located in the basement of 560 Lexington Avenue, adjacent to the 51st Street subway station. It opened in 1887 and is the second-smallest branch of the NYPL system. Two campuses of the City University of New York (CUNY)—the doctorate-granting CUNY Graduate Center and the Stella and Charles Guttman Community College—are located in Midtown, while Baruch College, also of the City University of New York, is located in Midtown South. 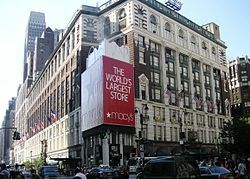 Mercy College is situated at Herald Square. 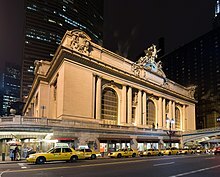 Pennsylvania Station and Grand Central Terminal are the two major railroad stations located in Midtown Manhattan. Penn Station serves Amtrak, NJ Transit, and the Long Island Rail Road (LIRR), while Grand Central serves the Metro-North Railroad and will serve the LIRR in the future. 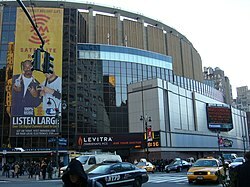 Penn Station is considered to be the busiest transportation hub in the Western Hemisphere, servicing around 650,000 people per day. The Port Authority Bus Terminal is located at Eighth Avenue and 41st Street at the western edge of Midtown. The terminal is the largest in the United States and busiest in the world by volume of traffic, serving more than 65 million people per year. The New York City Subway and MTA Regional Bus Operations each operate several routes that go through Midtown. Additionally, the PATH train to New Jersey terminates at 33rd Street and Sixth Avenue in Midtown. Traffic congestion is common, especially for crosstown traffic. In 2011, a new system of traffic light control, known as "Midtown in Motion" was announced, with the aim of reducing traffic congestion. Approximately 750,000 vehicles enter Midtown Manhattan on a fall business day. According to the 2011 Traffic Data Report for New York State, 777,527 vehicles a day went through select toll facilities into Manhattan. The New York Supreme Court, Appellate Division, First Department, is located in the Rose Hill section of Midtown Manhattan. The Puerto Rico Federal Affairs Administration operates its New York office on the 22nd floor at 135 West 50th Street. 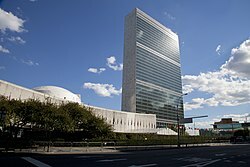 Several countries, including Argentina, The Bahamas, People's Republic of China, Costa Rica, Germany, Ireland, Israel, Jamaica, Japan, Luxembourg, Mexico, Morocco, Saudi Arabia, Singapore, South Africa, South Korea, United Kingdom, and Ukraine, have consulates-general in Midtown Manhattan accredited to the United States. In addition, the Taipei Economic and Cultural Office of the Republic of China (Taiwan) is in Midtown Manhattan. ^ a b c "NYC Planning | Community Profiles". communityprofiles.planning.nyc.gov. New York City Department of City Planning. Retrieved March 18, 2019. ^ a b c d "Midtown neighborhood in New York". Retrieved March 18, 2019. ^ a b Table PL-P3A NTA: Total Population by Mutually Exclusive Race and Hispanic Origin - New York City Neighborhood Tabulation Areas*, 2010, Population Division - New York City Department of City Planning, March 29, 2011. Accessed June 14, 2016. ^ Janette Sadik-Khan (January 9, 2017). "A plea for Fifth Avenue". The New York Times. Retrieved January 9, 2017. ^ Kilgannon, Corey; Heisler, Todd (September 6, 2018). "The Empty Storefronts of New York: A Panoramic View". The New York Times. Retrieved February 11, 2019. ^ Remnick, Noah; Schlossberg, Tatiana (August 24, 2015). "New York Today: Transforming Times Square". The New York Times. Retrieved January 10, 2017. 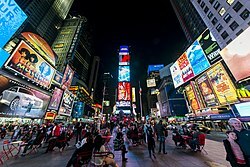 ^ "Times Square – The Official Site of Times Square". Times Square District Management Association, Inc. Archived from the original on January 18, 2017. Retrieved January 10, 2017. ^ "Times Square". Encyclopædia Britannica. Retrieved January 10, 2017. ^ Pramis, Joshua (October 2011). "World's Most-Visited Tourist Attractions No. 1: Times Square, New York City". American Express Publishing Corporation. Archived from the original on February 1, 2015. Retrieved January 10, 2017. ^ "The Most Jivin' Streetscapes in the World". Luigi Di Serio. 2010. Archived from the original on September 21, 2014. Retrieved January 10, 2017. ^ "New York Architecture Images- Midtown Times Square". 2011 nyc-architecture. Archived from the original on January 25, 2017. Retrieved January 10, 2017. ^ "Manhattan core public parking study" (PDF). Archived from the original (PDF) on March 4, 2016. Retrieved September 13, 2018. ^ "Q3 2018 U.S. Office Market Outlook - Download research report". Colliers International. December 6, 2018. Retrieved April 13, 2019. ^ "Contact Archived July 20, 2012, at Archive.today." 4Kids Entertainment. Retrieved on October 13, 2009. ^ "National Sponsorships and Donations." Barnes & Noble. Retrieved on January 29, 2010. ^ "Corporate." Calvin Klein. Retrieved on January 26, 2010. ^ "Locations." Cantor Fitzgerald. Retrieved on October 4, 2009. ^ a b "Contact Info Archived November 29, 2009, at the Wayback Machine." CBS Corporation. Retrieved on November 3, 2009. ^ "Legal/Privacy Archived February 6, 2016, at the Wayback Machine." Colgate-Palmolive. Retrieved on June 26, 2010. ^ "Global locations." Cushman & Wakefield. Retrieved on November 12, 2009. ^ "More Privacy Information." DC Comics. Retrieved on August 28, 2009. ^ "Contact Us." Deloitte. Retrieved on December 7, 2009. ^ "address.gif Archived December 8, 2010, at the Wayback Machine." Duane Reade. Retrieved on December 22, 2010. "Duane Reade Inc. 440 Ninth Ave New York, NY 10001." ^ "Corporate Information Archived February 23, 2010, at the Wayback Machine." Estée Lauder Companies. Retrieved on February 29, 2010. ^ "Foot Locker, Inc." Foot Locker. Retrieved on January 22, 2010. ^ "About." Frederator Studios. Retrieved on April 9, 2010. ^ "Contact Hess." Hess Corporation. Retrieved on February 9, 2009. ^ "Office Locations Archived August 10, 2011, at the Wayback Machine." Kroll Inc. Retrieved on August 14, 2011. "Kroll Corporate Headquarters 600 Third Avenue New York, New York 10016 United States"
^ "Company Profile Archived June 24, 2011, at the Wayback Machine." L-3 Communications. Retrieved on March 10, 2010. ^ "Contact Us." Marsh & McLennan Companies. Retrieved on October 4, 2009. ^ "Company and Contact Info Archived September 5, 2009, at the Wayback Machine." Marvel Entertainment. Retrieved on August 28, 2009. ^ Ramirez, Anthony. "MetLife Sells 2nd Building, A Landmark On Park Ave." The New York Times. April 2, 2005. Retrieved on August 25, 2009. ^ "Contact." MidOcean Partners. Retrieved on March 5, 2010. ^ "Contact Us." Morgan Stanley. Retrieved on August 28, 2009. ^ "NBC Universal to sell Burbank, Calif, studio." MarketWatch. Retrieved on August 28, 2009. ^ "Contact Us." The New York Times Company. Retrieved on August 28, 2009. ^ "NexCen Homepage." NexCen Brands. Retrieved on February 26, 2010. ^ "Contact Us." Pfizer. Retrieved on April 3, 2010. ^ "Contact Us." Ralph Lauren Investor Relations. Retrieved on January 27, 2010. ^ "Corporate Addresses." Saks Incorporated. Retrieved on March 1, 2010. ^ "About Us." The Sharper Image. Retrieved on February 18, 2010. ^ "Contact Us Archived September 20, 2010, at the Wayback Machine." Six Flags. Retrieved on May 6, 2009. ^ "Contact Us Archived July 22, 2010, at the Wayback Machine." TBWA Worldwide. Retrieved on July 8, 2010. "488 Madison Avenue, New York, New York 10022 United States"
^ "About Us." Thomson Reuters. Retrieved on August 28, 2009. ^ "AOL Time Warner's Future Home Is Damaged by Fire; The morning blaze at the building under construction in New York spread to parts of four floors. The cause is under investigation." Los Angeles Times. April 9, 2003. Business C3. Retrieved on August 28, 2009. ^ "Investor Relations Contact Us Archived April 1, 2010, at the Wayback Machine." Time Warner Cable. Retrieved on March 6, 2010. ^ "Contact." Univision. Retrieved on August 28, 2011. "605 Third Avenue, 12th Floor New York, NY 10158"
^ "Contact Us." New York Institute of Finance. Retrieved on October 4, 2009. ^ "Haier Building." Haier. Retrieved on January 26, 2009. ^ "Office Network Archived February 1, 2009, at the Wayback Machine." Sumitomo Corporation. Retrieved on January 25, 2009. ^ "Worldwide Offices USA." El Al. Retrieved on September 29, 2009. ^ "Air France in the United States Archived January 6, 2011, at the Wayback Machine." Air France. June 11, 2007. 15 (15/16). Retrieved on February 13, 2010. "The Air France “United States” regional management is located in New York: 125 West 55th Street, New York, NY 10019 Tel: (212) 830–4000." ^ "Welcome to Air France career opportunities." Air France USA. Retrieved on February 13, 2010. ^ "FAQs Archived April 11, 2011, at the Wayback Machine." Machette Book Group. Retrieved on April 17, 2011. "Hachette Book Group Marketing Department 237 Park Avenue New York, NY 10017"
^ "Alitalia stays in Midtown through creative deal." Real Estate Weekly. December 14, 1994. Retrieved on June 15, 2010. ^ "Contact Us Archived February 18, 2010, at the Wayback Machine." Global Infrastructure Partners. Retrieved on February 27, 2010. ^ Morris, Keiko (July 28, 2014). "Wanted: Biotech Startups in New York City: The Alexandria Center for Life Science Looks to Expand". The Wall Street Journal. Retrieved August 1, 2014. ^ "DEPARTMENT OF FINANCE PUBLISHES FISCAL YEAR 2015 TENTATIVE ASSESSMENT ROLL" (PDF). New York City Department of Finance. January 15, 2014. Archived from the original (PDF) on February 2, 2014. Retrieved January 23, 2014. ^ McTiernan, Andy (2008). "A quantum leap for capital assets". The Free Library By Farlex. Retrieved October 16, 2014. ^ Robert Frank (October 6, 2014). "Waldorf becomes most expensive hotel ever sold: $1.95 billion". CNBC. Retrieved October 9, 2014. ^ Quirk, James. "Bergen offices have plenty of space". Archived from the original on December 22, 2007. , The Record (Bergen County), July 5, 2007. Accessed July 5, 2007. ^ Erin Carlyle (October 8, 2014). "New York Dominates 2014 List of America's Most Expensive ZIP Codes". Forbes. Retrieved October 9, 2014. ^  Accessed February 16, 2019. ^ World Airline Directory. Flight International. March 20, 1975. "472. ^ Sterba, James P. "American Will Shift Headquarters From Manhattan to Dallas Airport; Big Economies Predicted." The New York Times. Thursday November 16, 1978. Page A1. Retrieved on August 27, 2009. ^ Senate Committee on the Judiciary. Juvenile Delinquency: Comic Books. Motion Pictures. Obscene and Pornographic Materials. Television Programs. Greenwood Press, 1969. 47. Retrieved on January 25, 2011. "American Comics Group, 45 West 45th Street, New York, NY"
^ Rice, Diana. "News notes from the field of travel; Cape Cod air service tours to Spain for honeymooners Vermont music camp currency guide trail riders ride again Griswold's country club here and there." The New York Times. April 30, 1950. Drama-Music, Fashion-Screen, Page X17. Retrieved on August 25, 2009. "American and American Overseas Airlines executive offices have moved from 100 East Forty-second Street to 100 Park Avenue"
^ "Contact Us". Archived from the original on March 12, 2007. Retrieved May 24, 2017. . Central Park Media. March 12, 2007. Retrieved on September 14, 2009. ^ "250 West 57th Street." W&H Properties. Retrieved on September 14, 2009. ^ Bernstein, Aaron. Grounded: Frank Lorenzo and the Destruction of Eastern Airlines. Beard Books, 1999. 22. Retrieved on August 28, 2009. ^ "Company Information". GoodTimes Entertainment. June 17, 2000. Archived from the original on June 17, 2000. ^ Johnson, Doris McNeely. "Children's Toys and Books: Choosing the Best for All Ages from Infancy to Adolescence." Scribner, 1982. Unknown page. Retrieved from Google Books on July 8, 2010. ISBN 0-684-17767-6, ISBN 978-0-684-17767-0. "LJN Toys, Inc. 200 Fifth Ave. New York, NY 10010." ^ "Corporate Directory". Archived from the original on January 4, 2002. Retrieved July 28, 2010. . NewKidCo. January 4, 2002. Retrieved on July 27, 2010. ^ Dunlap, David W. "Final Pan Am Departure." The New York Times. Friday September 4, 1992. Retrieved on August 25, 2009. ^ "Contact Us". Archived from the original on April 9, 2001. Retrieved April 9, 2001. . Philip Morris Companies. April 9, 2001. Retrieved on October 19, 2009. ^ "Philip Morris to Move Headquarters from New York City to Richmond, Va.." New York Daily News. March 5, 2003. Retrieved on October 19, 2009. ^ "World Airline Directory." Flight International. March 26, 1970. "Trans Caribbean" 504. ^ World Airline Directory. Flight International. March 20, 1975. "508. ^ "Map." Turtle Bay Association. Retrieved on January 25, 2009. ^ Brown, Betsy (July 19, 1987). "Mount Kisco Awaits Arrival of T.W.A." The New York Times. Retrieved January 5, 2009. ^ Wax, Alan J. "Aer Lingus moving offices to LI." Newsday. April 10, 1997. A61. ^ a b c d e f g h i j k l m n o "Midtown (Including Flatiron, Herald Square, Midtown, Midtown South, Times Square and Union Square)" (PDF). nyc.gov. NYC Health. 2018. Retrieved March 2, 2019. ^ "NYC-Manhattan Community District 4 & 5--Chelsea, Clinton & Midtown Business District PUMA, NY". Retrieved July 17, 2018. ^ "Find Your Precinct and Sector - NYPD". www.nyc.gov. Retrieved March 3, 2019. 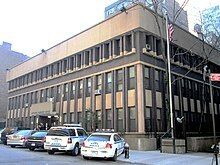 ^ "NYPD – 18th Precinct". www.nyc.gov. New York City Police Department. Retrieved October 3, 2016. ^ "NYPD – 14th Precinct". www.nyc.gov. New York City Police Department. Retrieved October 3, 2016. ^ "Midtown Manhattan – DNAinfo.com Crime and Safety Report". www.dnainfo.com. Retrieved October 6, 2016. ^ "18th Precinct CompStat Report" (PDF). www.nyc.gov. New York City Police Department. Retrieved July 22, 2018. ^ "14th Precinct CompStat Report" (PDF). www.nyc.gov. New York City Police Department. Retrieved July 22, 2018. ^ a b "FDNY Firehouse Listing – Location of Firehouses and companies". NYC Open Data; Socrata. New York City Fire Department. September 10, 2018. Retrieved March 14, 2019. ^ "Engine Company 1/Ladder Company 24". FDNYtrucks.com. Retrieved March 14, 2019. ^ "Engine Company 23". FDNYtrucks.com. Retrieved March 14, 2019. ^ "Engine Company 26". FDNYtrucks.com. Retrieved March 14, 2019. ^ "Engine Company 54/Ladder Company 4/Battalion 9". FDNYtrucks.com. Retrieved March 14, 2019. ^ "Engine Company 65". FDNYtrucks.com. Retrieved March 14, 2019. ^ a b "Midtown, New York City-Manhattan, New York Zip Code Boundary Map (NY)". United States Zip Code Boundary Map (USA). Retrieved March 23, 2019. ^ "Why do some buildings have their own ZIP codes?". am New York. March 18, 2019. Retrieved March 23, 2019. ^ "Location Details: Appraisers Stores". USPS.com. Retrieved March 7, 2019. ^ "Location Details: Bryant". USPS.com. Retrieved March 7, 2019. ^ "Location Details: Grand Central". USPS.com. Retrieved March 7, 2019. ^ "Location Details: Midtown". USPS.com. Retrieved March 7, 2019. ^ "Location Details: Murray Hill". USPS.com. Retrieved March 7, 2019. ^ "Location Details: Rockefeller Center". USPS.com. Retrieved March 7, 2019. ^ "Location Details: James A Farley". USPS.com. Retrieved March 7, 2019. ^ "New York City's main post office stops 24-hour service." Associated Press. Friday April 17, 2009. Retrieved on May 5, 2009. ^ "Midtown – MN 05" (PDF). Furman Center for Real Estate and Urban Policy. 2011. Retrieved October 5, 2016. ^ a b "Midtown New York School Ratings and Reviews". Zillow. Retrieved March 17, 2019. ^ "Jacqueline Kennedy Onassis High School". New York City Department of Education. December 19, 2018. Retrieved March 23, 2019. ^ "Landmark High School". New York City Department of Education. December 19, 2018. Retrieved March 23, 2019. ^ "Murray Hill Academy". New York City Department of Education. December 19, 2018. Retrieved March 23, 2019. ^ "Repertory Company High School for Theatre Arts". New York City Department of Education. December 19, 2018. Retrieved March 23, 2019. ^ "Satellite Academy High School". New York City Department of Education. December 19, 2018. Retrieved March 23, 2019. ^ http://www.nylanguagecenter.com/index.php/manhattan-midtown Retrieved on November 13, 2013. ^ Clarke, Catherine. "Italian private school drops $55M on new NYC cultural and education center " (Archive). New York Daily News. Friday September 11, 2015. Retrieved on February 25, 2016. ^ a b c "NYPL Locations". The New York Public Library. Retrieved March 23, 2019. ^ "About the Stephen A. Schwarzman Building". The New York Public Library. Retrieved March 23, 2019. ^ "About the Science, Industry and Business Library". The New York Public Library. Retrieved March 23, 2019. ^ This does not include five additional branches located between 14th and 59th Streets but are not part of Midtown proper. These are the Columbus, Epiphany, Kips Bay, and Muhlenberg branches and the Heiskell Braille and Talking Book Library. ^ "About the 53rd Street Library". The New York Public Library. Retrieved March 23, 2019. ^ "Donnell Library Center". The New York Public Library. Retrieved March 23, 2019. ^ "About the 58th Street Library". The New York Public Library. May 10, 1907. Retrieved March 23, 2019. ^ "About the Grand Central Library". The New York Public Library. Retrieved March 23, 2019. ^ a b "About the Muhlenberg Library". The New York Public Library. Retrieved March 23, 2019. ^ Campbell, Barbara (October 21, 1970). "Dream of Library Realized". The New York Times. Retrieved December 22, 2018. ^ "Overdue: The Public Library". New York Daily News. December 28, 1980. p. 170. Retrieved December 18, 2018 – via Newspapers.com. ^ "About Terence Cardinal Cooke-Cathedral Library". The New York Public Library. Retrieved March 23, 2019. ^ "The Most Awful Transit Center in America Could Get Unimaginably Worse". ^ "More People Pass Through Penn Station Each Day Than Through LaGuardia, JFK, and Newark Airports Combined". ^ "Port Authority Board Awards Contract to Conduct Comprehensive Study and Create Plan to Improve and Revitalize Bus Terminal" (Press release). June 27, 2013. ^ "Subway Map" (PDF). Metropolitan Transportation Authority. January 18, 2018. Retrieved January 18, 2018. ^ "Manhattan Bus Map" (PDF). Metropolitan Transportation Authority. December 2017. Retrieved April 24, 2018. ^ "About PRFAA – New York Office", Puerto Rico Federal Affairs Administration. Retrieved on July 18, 20139. ^ Consular/Travel information. Retrieved on January 26, 2009. ^ Home page. Retrieved on January 25, 2009. ^ Consulates in the United States. Archived January 23, 2009, at the Wayback Machine Retrieved on January 31, 2009. ^ Address, Contact, Hours. Archived November 17, 2008, at the Wayback Machine Retrieved on January 26, 2009. ^ Ireland in New York. Archived July 19, 2011, at the Wayback Machine Retrieved on January 25, 2009. ^ Consular Department. Retrieved on January 26, 2009. ^ Contact Us. Retrieved on January 30, 2009. ^ Location/Hours/Contact. Retrieved on January 25, 2009. ^ Home. Retrieved on January 28, 2009. ^ Home Page. Archived February 27, 2009, at the Wayback Machine Retrieved on January 25, 2009. ^ Home. Retrieved on January 25, 2009. ^ Ministry addresses in the U.S. Retrieved on January 26, 2009. ^ Singapore Consulate in New York Mission Homepage. Retrieved on January 28, 2009. ^ Home Page. Retrieved on January 26, 2009. ^ Consulate General of the Republic of Korea in New York. Retrieved on January 28, 2019. ^ New York. UK in the USA. Retrieved on January 25, 2009. ^ Ukrainian Consul, home page Archived January 22, 2009, at the Wayback Machine. Retrieved on January 26, 2009. ^ Taiwan Embassy. Retrieved on January 25, 2009.